I don't like all the pre-made Suggested Stories. How can I remove them from my RealPlayer/RealTimes Library? Can I turn this feature off? 1. Open RealPlayer and click the RealPlayer logo at the top left. 2. In the drop-down menu, click Preferences. 3. Under Library & Device Sharing, click Stories. 4. Clear the checkbox under Suggested Stories. You will no longer see any automatically created Stories (including those that the program created previously). Stories you saved will remain, and you are still welcome to create your own. 1. 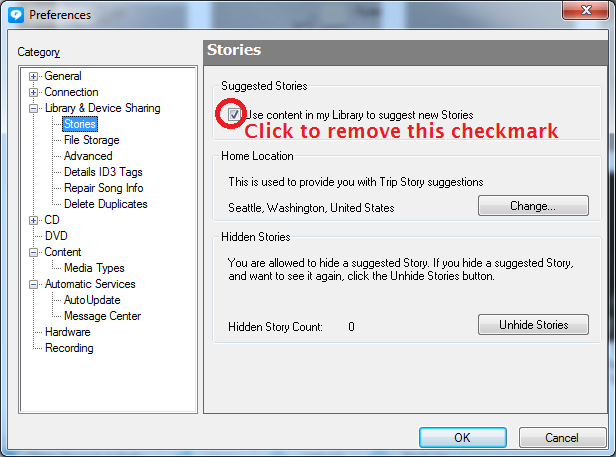 Select one or more Stories (use CTRL or SHIFT to select multiple Stories). 2. Right-click and select Delete. 3. In the window that pops up, click the option to Remove from PC Library. To unhide Stories, go to Preferences > Library & Device Sharing (or Media Library if you're on a Mac). Select Stories, then click the Unhide Stories button. This will unhide all hidden Stories. NOTE: Suggested Stories are created based on locally stored content, and will be different between your PC and any mobile devices. Turning off or hiding Suggested Stories on your PC won't affect the Suggested Stories that appear on your Android or iPhone, and vice versa.